Danny Boyle’s Trance is a brilliant, unsettling piece of cinema, and the director's nastiest since his 1994 debut Shallow Grave. Today is not a good day for auctioneer Simon (James McEvoy). When the auction of Goya’s Witches in the Air turns into a heist, Simon receives a blow to the head while attempting to secure the priceless painting in the auction house’s vault. At least that’s how it appears. In reality Simon is the inside man, assisting Frank (Vincent Cassel) and his gang to steal the painting. Things get a whole lot worse for Simon when Frank discovers the painting is missing, and that Simon’s head injury means he can no longer remember what he did with the painting. The solution? He enlists the help of hypnotherapist Dr. Elizabeth Lamb (Rosario Dawson) to recover his memory, and the painting. As this summary of the plot suggests, Trance operates very much within the genre of pulp-thriller, and there’s even a nice nod to the fine tradition of British gangster films in the opening moments of the film. However, this summary covers what amounts to little more than an overture to the real story of the film. Like Reservoir Dogs (1991), it’s all about what happens after the heist. Trance is fundamentally a film about secrets: as Elizabeth claims, forgetting is just a secret you keep from yourself. The parallels that the film draws between the process of the heist and the use of hypnosis to retrieve information from Simon recalls Christopher Nolan’s Inception (2010), and - in a way - Trance does feel like Boyle doing Nolan. And he does it so very, very well. Trance isn’t po-faced in the way Nolan's post-Memento (2000) films are, with Boyle seemingly delighting in the lurid nature of his subject matter. These pleasures are somewhat overshadowed by a misogynistic streak usually absent from Boyle’s work, and an all too easy aligning of secrets/revelation with “Woman” and the female body. The film is so tied to Simon’s subjectivity however, that such allegations need to be carefully considered before appointing blame to either the filmmaker or the characters. Simon’s fractured subjectivity is wonderfully evoked through Anthony Dod Mantle’s superb cinematography: there are beautiful, angular compositions of frames-within-frames; a cornucopia of mirrors and reflective surfaces; beautiful, painterly use of light and shadow, together with a number of other striking in-camera effects. The images remain just on the comprehensible side of abstraction, and the film plays off the coldness of these distancing effects with visceral, invasive close-ups. These effects are complementary rather than distracting, the film formally evoking a body/mind divide. Beautiful cinematography would count for very little if the film didn’t still function effectively as a thriller. Fortunately Trance does fulfil this criteria, although it may be a little too twisty for its own good. Each plot twist serves to unsettle audience sympathies, and some revelations are truly shocking. Indeed Trance would make a suitable, if rather bleak, double-bill with Side Effects (2013). 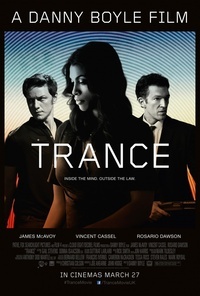 Trance is hardly the "feel good film of the year"; it is, however, a visceral and visually stunning psychological thriller about love, revenge, and what it means to be human. This review was published on March 27, 2013.